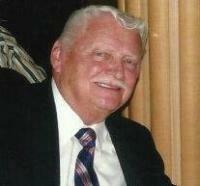 Host Jack D. Renz was born and raised in Toledo, OH. For the past six years, he and his team have worked together to bring their listeners great music, fun stories, interesting news, and delicious food and drink recipes. Jack is the Chairman of the German-American Festival (GAF), the largest ethnic festival in Northwest Ohio. He belongs to the Toledo Schwäbischer Unterstützungs Verein, the Toledo Holzhacker Buam (Bavarian dance group), and The Greater Beneficial Union (GBU) of Toledo, all of which are part of the 7 Societies of the German-American Festival Society at Oak Shade Grove in Oregon, OH. He is the principal of Woodward High School in Toledo and he is the Relief Chairman of the Old Newsboys Goodfellow Association. His wife, Christina, helps take care of the behind-the-scenes work, as well as calling in with the German Word of the Week for the show. Together, they have two daughters, Annika and Arya. Co-host Vern Basilius is a long-time member of the German-American Community of Toledo. He has been to everyone of the 51 German-American Festivals and he has helped to run each of them. He belongs to the GBU, the Schwaben Verein, and the Toledo Turners. Vern was a member of the very popular Toledo band The Tirolers and he is now the bass player and lead man of his own band, Encore. Special Correspondent Hans Otto is another figure of the Toledo German-American Community. Hans Otto belongs to the Toledo Holzhacker Buam, the GBU, and the Toledo Turners. He is Vice Chairman of the GAF and he runs the ever-popular Wein Bar. 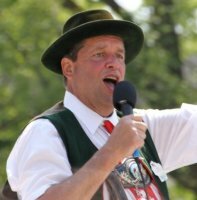 Assistant Special Correspondent Hans Bruno is a strong member of the Milwaukee (WI) German-American Community. He is the lead singer for the Alte Kameraden Brass Band, a member of D'Lustig'n Wendlstoana (Bavarian dance group), and Frau Christina's father.